Conflict resolution skills work. Managing stress calmly, controlling emotions, dealing with issues in a positive and constructive way, are all healthy approaches to conflict. Communication is a significant piece of this family puzzle. Don't let family conflict own you. There's usually an uptick of pressure and stress within a family at the start of a new school year. Conflict is inevitable, resolution possible when the skills associated with conflict resolution are applied. The term was prevalent a few years ago, and the effectiveness remains. Children learn what they live. If a family practices good communication skills, those skills spill over into the child's life outside the home. When they learn to be good communicators, those skills are internalized and applied in other situations. Conflict resolution skills can help you and your family cope with stress in a more constructive way. Following are two books that hold up well in today's world. They both focus on communication within the family. Every good book offers something and these books have stood the test of time, are relevant and contain sound advice. Anticipation and organization can be key to diminishing family conflict. A personal favourite author Dr. Haim Ginott wrote Between Parent and Child over 45 years ago and yet it speaks as much to today's parent as it did when first published. As in so many things in life, common sense is really a key factor in parent/child relationships. With clarity, humour, and understanding he describes the various ways to deal with your child. In 2003 it was updated by his wife Dr. Alice Ginott. It explains ways 'to discipline without threats, bribes, sarcasm or punishment'. A parent's goal is to encourage trust and self-confidence in their child.
" Child give me your hand that I may walk in the light of your faith in me." Another book originally published in 1980 and updated in 2012 is described by the Boston Globe as " The Parenting Bible'. 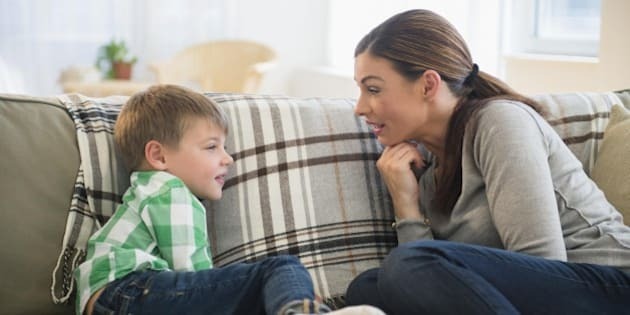 How to Talk So Kids Will Listen And Listen So Kids Will Talk by Adele Faber and Elaine Mazlich highlights the need for empathy on both sides of the family fence, whether parent and child. "Are you really listening or are you just waiting for your turn to talk?" Faber and Mazlich believe that "it is never to early nor never too late" to start practicing effective listening and speaking skills within the family. Understanding conflict is the first step in dealing with the issue effectively. Both at home and at school, there are three areas of conflict. Territory is one. It can start at breakfast, with a child's personal space invaded by siblings. We have all experienced the "picking at each other and not the food" syndrome that happens. Simple definitions of space, a chair or placemat established the night before can make the difference. Anticipation and organization can be key to diminishing family conflict. Relationships: the next factor. Our lives are a series of relationships both at home and school. Learning to deal with others using positive social skills are lessons that will last a lifetime. Possessions: the third factor in conflict. Big and little 'things' can be the precipitators of a conflict. Mike Fisher, a family anger management specialist in the UK was interviewed recently for a very informative piece published in The Guardian. According to his work, the biggest trigger for anger in a family is a child's lack of co-operation. The parent's inability to articulate emotional reaction exacerbates an already volatile situation. Understanding conflict and reacting appropriately is a key factor in diffusing these tense family moments. As parents you are not going to get it "right" 100% of the time, so don't be hard on yourself. Every time you deal with conflict effectively is a victory. At school, the most effective element of conflict resolution programming is that it be consistent across the grades and throughout the year. The Peaceworks Program from The Peace Education Foundation is a grade specific program for K to grade 12. I was a facilitator for The Peaceworks Program during my teaching career and saw the positive effect in my school and throughout the school district. Being trained as a trainer in the Peaceworks Progam was one of the most significant turning points in my adult life. I learned to understand conflict, power and control and how to use those three elements effectively both in my professional and personal life. I was a better teacher and a better parent as a result. The program is described as a "unified sequence of content and skills." The lessons are clearly laid out and approachable for teachers. Research has proven that this program is results driven. For our children, learning to deal with others in a positive, pro-social manner is one of life's most important lessons, if not the most important lesson. At the end of the school day, instead of asking "what did you do at school today?" ..ask your child " how did you get along with everyone today?"